Being part of the Go to Market team and Microsoft’s One Commercial Partner team, I work with a lot of SaaS partners. I’m fascinated by the challenges in this space and especially the conversation around business models and where to invest. I want to cover four things today, about what sort of digital transformation is happening in the market and what are the opportunities. How do we make it real from a go to market perspective? What does it look like when you get down to it? And then, the tools and resources and where to go next. 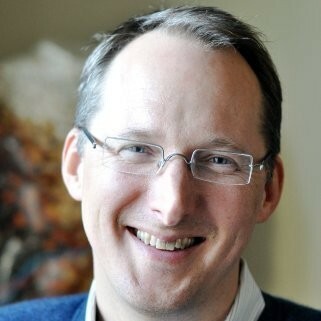 Microsoft’s vision is this is a mobile-first, cloud-first world. So, you’ve got to invest in a wide variety of areas where your solution runs. First, there are multiple of form factors. Touch, not touch, desk, mobile, voice activated. Then, these devices create a massive amount of data. AI will play an critical role to glean insights and to decide where to invest. How are consumers using these devices? How will they use them in the future? And last, it’s server-less. Because of all this data, you need more agile ways to build and deliver these solutions. Containers are already playing a big role. There is tremendous opportunity around these new innovations from a technology standpoint coming to the market and being leveraged. What is our massive opportunity? $4.5 trillion is the opportunity right now globally. The estimate in the U.S. alone is around $1.7 trillion. Microsoft has tackled, grown and engaged starting with the PC all the way up through the mobile cloud and now the intelligent cloud. Partners play a key role in this. No one company can tackle and solve this on their own. We’ve got massive changes going on in the enterprise and across businesses. That’s where partners come in. 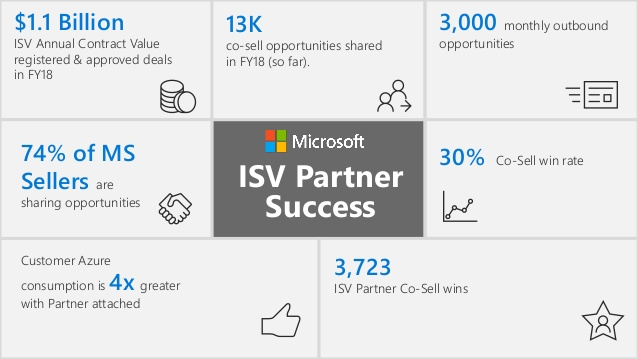 How successful has Microsoft’s ISV partnerships been? $1.1 Billion – ISV Annual Contract Value registered and approved deals in FY18. 74% of MS Sellers are sharing opportunities. That is 74% of the Microsoft field is having conversations with the customer and saying “Well, I think I’ve got an opportunity for one of our partners” and putting the lead into the lead sharing tool, tossing that over the fence to one of our partners. 13K co-sell opportunities shared in FY18 (so far). Customer Azure consumption is 4x greater with Partner attached. Azure consumption is central to the growth of our business and central to the growth of Microsoft. We’ve got this tremendous opportunity and we can’t do it ourselves. We need partners to do it. Whether it’s a contract lifecycle management solution, or a CPQ solution, or an HR solution that plugs into CRM, we’re seeing great Azure consumption because you are solving problems. 3,723 ISV Partner Co-Sell wins. There are four main key areas where we’re looking to transform businesses and help companies transform the business. Empowering employees. How can we make employees more efficient and effective at what they do day in and day out? Really engaging customers. What are the new ways you can engage customers to glean insights and problem solve with them? Build an ongoing relationship with them that’s more meaningful and more insightful? Optimizing operations. A lot of people in SaaS space are really focusing on this area. Transforming products. This is where a lot of the data on AI and machine learning come in. The modern workplace to tackle the modern employee. Business applications that integrate with CRM and other business applications to drive more meaningful engagement with customers. The apps and infrastructure layer to optimize your operations. Data and AI, which is key to a lot of the next wave of application development and building meaningful services to solve these problems. We’re need partners to engage with us around these four areas. How do you partner with Microsoft? How do you partner with Microsoft? How do you get started? It’s a daunting task. Microsoft is a big company and we’ve gone through our own digital transformation. Last July, we went through the largest reorganization of our field sales and marketing organization in 10 years. We have 120,000 employees in the company. We’ve got 45,000 sellers globally. And the main reason we did it was to make it more effective for our sellers to sell to our customers, engage with our customers, and how we organize our partnerships. The Microsoft partnering organization was pretty vast. There were different groups talking with partners, like VARs, SIs and ISVs, sprinkled all through the company which make this process hard. We brought that all into one group called One Commercial Partner which is focused on increasing profitable growth for our partners. How do you build your practice? How do you build your applications together with us? How do you go to market together and create demand generation to drive that business and start driving a return on your investment? How do you become more effective in co-selling and drive your partner attach rate? How do we drive more business and be more effective at building with you and building your practice together? The next is how do we make it easier for you to interface with us? Whether it’s 1-to-1 or through our partner channel or through our network of different partners. We have got to make it easier for partners to navigate all the different opportunities available. How do partners go to market with Microsoft? So what does go-to-market engagement looks like? It’s a simplified approach for partners to come to Microsoft and really engage with us on this opportunity. We have four main areas to give you the resources and support. First you need to ask: what business model should I be in? How is that evolving over time? What sort of offers do I need to have in the marketplace to compete, given the business models that are being generated to tackle that business opportunity? Next is building customer awareness. What are the programs and the things you need to do to drive awareness depending on the target audience we’re going after? What segment of the market? It’s all about building customer awareness. These awareness programs will differ vastly depending if you’re targeting enterprise or if you’re targeting SMB. How you strike that right balance? One challenge is when you are evolving from SMC and SMB into the enterprise. So, how do you make that shift while retaining your base of customers while you want to grow to those bigger opportunities? We can help you answer that. Third is generating leads, as well as accelerating and closing the pipeline. Where do I invest to have the biggest impact on generating opportunities for my product and service? It’s all academic until you close the deal. There is a lot of focus on joint execution and resources you can tap into. 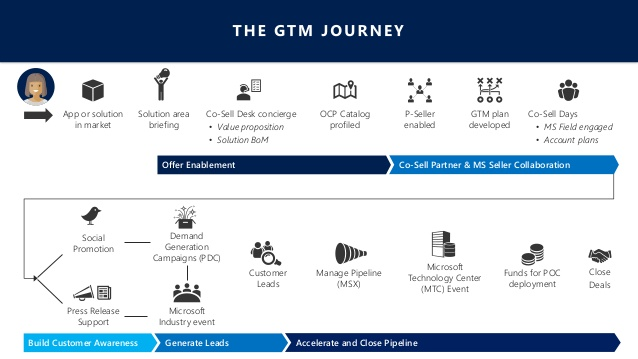 Whether it’s attending events for our customers or different campaigns that are all about helping you win deals as part of that engagement, across not only the Microsoft field but also our large partner ecosystem. Finally, what does this journey looks like? Everybody’s got the same fundamentals. You start with your app solution and market. You focus on the value proposition. Make sure you’ve got a good bill of materials. What’s that joint value proposition? Let’s make sure that we get that story into our One Commercial Partner catalog of solutions that our field sellers and our field marketers tap into every single day to identify what solutions might be relevant to their customers. What are some of the challenges you’re solving for today? What about the ones that are three-to-five years out? How are you going to tackle those? We’re always looking for new solutions depending on the challenges that customers are providing. We’ve got to make sure that we provide them with a great pipeline of solutions to tackle what’s next. How do we co-sell with partners? And then, we have our co-selling enablement and collaboration. How do we make sure that folks in our field and part of our ecosystem are aware of the great solutions you provide? To help with that we have our “P-seller program” to make sure you have a good go-to-market plan to take advantage of all we have available. We also hold co-sell days where we do this consistently at our Microsoft Technology Centers. We bring our customers in the same room with our ISVs or SI partners to have this conversation. We do fast pitches and networking sessions. We educate our customers about the different solutions that could help solve their problems and we curate them. Sometimes we’ll do themes around a particular day. It could be security one afternoon. It could be operations targeted to VPs and CIOs and procurement. It really depends on what we’re seeing in the local marketplace. You could have something around targeting oil and gas operations in the south central area of Texas or Oklahoma. It might be Tech or Healthcare in the southwest. This is a really powerful tool. We’ve got social programs that we leverage and drive awareness for these offers. If we’re going to run an event, we’re going to make sure that people know about it. We’ll do press release support. We’ll do social promotion. And we also do some Demand Gen. How are we turning these opportunities into the leads that are going to help drive your business and result in revenue for you? We’ll help you manage your pipeline. And in some cases we’ll fund Proof-of-Concepts for the customer to bring your solution up in their environment to make sure that it’s ready and scalable for deployment. Then we close the deal. So again, it’s all academic until we close. We have a proven methodology. We’ve seen it work over the last almost 12 months. This is a relatively new approach for Microsoft given the reorganization we just went through. But it is a really effective journey for most partners. What is it like to co-sell with Microsoft? We’ve got a really good process with which we’ve seen some great results. And it’s all about account-based planning and marketing with our customers. Whether it’s an enterprise customer or an SMB customer or a corporate customer, we really try to use this methodology. It’s most relevant for our largest enterprise customers, but the principles are the same no matter the customer size. We qualify and share the opportunities together because we’ve got a great listening environment and understanding of what our customers are going through. We insert these different opportunities for these solutions in the market. We do account territory planning as well as Proof-of-Concepts and workshops together. We make sure that we’ve got a strong complementary skill set in the sales cycle. and that we’re collaborating on that sale. It’s not us going in separately. We’re trying to go in this together as much as possible to truly co-sell with our partners. We register the deal, because once we start sharing the leads we have a way of tracking within our system driving accountability amongst our sales and marketing. So if you share a lead with us our seller is then responsible and on the hook for either closing the deal with you, tracking it until it closes or tracking it until it’s lost. Most of the enterprises will have 20 to 30 opportunities for partners. So we make sure we are tracking and keeping that pipeline full. These are some tips from what we’ve learned over the last nine months selling with partners. Make sure you’ve got a relevant case study that’s easily communicable, easily understandable and tested. My recommendation would be: don’t just test it amongst your sales and marketing but test in this room. Test it in this room with some of your peers to make sure it’s relevant. Clarity on your target audience and messaging is critical. We see a lot of mistakes made early on in the process where partners make some assumptions that are not clear. Our guidance would be to simplify the business proposition as much as possible. Make it very clear, especially if you’re partnering with another large sales organization like Microsoft or someone in our partner ecosystem. Really simplify the message. Simplify what you’re asking that partner to do and how it’s relevant for them. Make sure you’ve got an ecosystem of partnerships to deliver the solution. This is especially relevant as you grow. Make sure you understand who in the ecosystem you need and be really vigilant about the rationale for how you choose your partners. Make sure you’ve got partnership-ready materials and it’s not just your own materials, if you’re going direct to a partner. Make sure you’ve got a separate set of partnership ready materials explaining what is the joint value proposition. It can change once you start selling with the partner. What is your joint value proposition? What’s the incentive for a partner seller to come in and sell your solution? How long does it take on average for your deals to close? Have you integrated on Azure? How much Azure does it drive? Do you have any visibility into that? Or if you’re integrating with CRM, does it drive incremental CRM seats or usage? So how do you get started? The first place to start is the Microsoft Partner Network which is an additional resource for partners who are just starting out in our ecosystem. And as part of Microsoft Partner Network, we also have our ISV marketplace. I’m sure you’ve seen statistics on how marketplaces have become an increasingly important force. One of the interesting things is that we’re starting to see enterprise customers use marketplaces as SMB customers have been using marketplaces. Oftentimes, you see a particular team go in and say I need to modernize an application. We’re going to try container service and see if we can modernize this legacy application that we got through an acquisition 10 years ago and get it into the cloud or at least part of it in the cloud. We’re seeing a lot of that usage happen where big enterprises take little bites and try different solutions early on before they make a bigger investment to roll it out corporate wide. That’s an incredible shift happening in the market. We’ve got a lot more investments happening in our marketplace. How successful is our marketplace? We’ve got 120,000 enterprise customers using our marketplace. And it’s available in 150 countries. We’re seeing 300,000 leads in our marketplace go to partners monthly. We’re seeing a 40% conversion rate from trial to sell. A new SaaS subscription model. Container services, which used to be difficult and now it has become a viable solution for marketplaces. Microsoft Partner Network. That’s a great place to start. And it allows you to not only connect and provide a whole bunch of resources but there’s also a community of people who are committed to and have great knowledge in the ecosystem. We’ve got partners who have been there in the ecosystem for 30 years and they’ve evolved and started new businesses, got bought and continue to reinvest and engage. I think it’s a great place to start. Q: A lot of it sounds like; we’re business people we have to go back to companies and want to do a deal with Microsoft. A lot of it has to do with driving Azure. A lot of us are not on Azure. What can you do as business people? Arm us to help us get into your marketplace. So we don’t have to go back to engineering and figure it out. What we think is, it’s not restricted to Azure. I mean Azure is central to us. But look, we’ve got lots of other products. SQL and Office 365 dynamics and CRM. Some of the things we’re doing with Teams and Skype for business, it’s not just restricted to Azure. Obviously Azure is central to our growth. You can see from our latest earnings that we’re doing a pretty good job of growing but it’s not the only game in town. It’s an important game, but it’s not the only game in town. So if you’re integrating with CRM, we already spoke with a number of folks who are integrating with CRM, please continue to do that and look for new ways to drive sales. But yes, we’d love to talk with you about the Azure opportunity. We think we’ve got a very competitive offering. And we’re seeing some great success.